Travelling around Scotland it is becoming clear to me that free WiFi should no longer be seen as a perk it should be standard and everywhere from chain resort hotel to four bed guesthouse. Now I have no idea what percentage of people travel with WiFi enabled laptops but it's clearly not a market worth ignoring. Nor should it be seen in my opinion as a revenue stream. For small hotels and accommodation providers it offers a statement of intent. "Free WiFi" screams customer service and relationship building. It expresses that you've thought about those needs and therefore by a related thought process you'll have thought about the other little things that make a difference to them too. Anything that increases the desire to move from browsing to purchase has merit. And no longer is there a cost issue; BT and others are actively looking for businesses to become their WiFi hubs. We all know of certain chains and larger hotels that continue to offer four hours access to the internet through a third party provider for a tenner. Major loyalty disincentive and it may be about time that these hotels considered buying their way out of their long term customer unfriendly communciations contracts. Hotels should be shouting from their homepages that they offer it free. Anyway, as I sit here in a hotel in Kilmarnock writing the blog, I know for sure that my next business meeting - even over coffee - will take place here because I know I can access all my work and present and communicate professionally. One thought when putting in WiFi; consider highlighting areas or table with safe connections to plugs - some of us idiots continue to leave the office without charge machines! St Andrews Hotel, Bar and Bistro, Ogstons on North Street are the first property in the town to use Bookassist on their website but not it is thought the last. James Kennedy, from Bookassist Scotland, "We've been doing quite a lot of work recently in Fife with independant hotels throughout the county but whilst we've gone online with some great businesses such as The Inn at Lathones, Crusoe Hotel, Lundin Links and others we're delighted to have Ogstons on board now. Ogston's website features Bookassist's booking engine which is fully integrated into the design and layout with multiple languages and currencies available to the international visitor. Every little helps. Delighted to see that our friends at First in Fife Golf are getting the publicity their efforts deserve. The group were marketing last week at the Scottish Golf Show in the SECC in Glasgow and maybe as an outcome have gained some coverage from the bods at Homecoming Scotland. 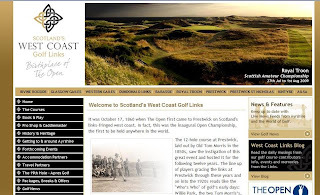 The Fife golf pass was featured in a piece of website editorial on the Homecoming Scotland website and hopefully it will drive some traffic to their new site which offers online tee times and booknigs for their value card. The group show what can be done when businesses with agreed goals and objectives come together with common purpose. When we first heard, four maybe five years ago, of the concept of a discount golf pass on golf courses we'd barely heard of we were to say the least sceptical; under the leadership of Mike Williamson and Ewan Watt from Burntisland however the group has gone from strength to strength with each of the individual businesses learning from the group operationally as well as financially. A reinvigorated website has just been launched for golf marketing group First in Fife Golf. The collection of twelve golf courses in and around west Fife came together about five years ago to promote their golf packages to the visiting golfer. Up against the big spending neighbours in St Andrews it was a strategic attempt to offer a value golf product to a market that they knew was out there. The results have been quite astonishing and the group have gone from success to success and become increasingly innovative. The new site already included online booking and a tee time management facility for all golfers buying the pass and this has now been complemented by online accommodation bookings using the Bookassist online reservations system, an interactive Google Mapping function and even their own First in Fife YouTube channel! Tee Time Twittering for Scotland? The way online marketing is going, we shouldn't be too surprised that a golf club should use Twitter to offer tee times. ApparentlyAtlantic Golf, the owner of Queenstown Harbor, the Golf Club at South River and Potomac Ridge golf courses, is encouraging its golfers to use Twitter to communicate with course management teams, talk about golf and set up tee times with direct messages sent to Atlantic Golf and golfers will also be able to respond to special discounts and promotions, at twitter.com/atlanticgolf. 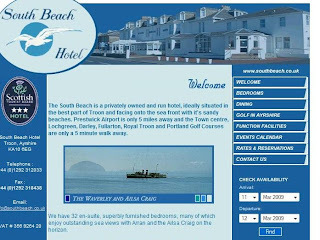 The South Beach Hotel Troon are the latest privately owned hotel in Ayrshire to turn to Bookassist for their online reservations. The hotel which has been in the Watt family for three generations is a well respected property for short break, business and golfing visitors to the world famous golfing destination. As well as incorporating the Bookassist Booking Engine into the website the hotel will also be doing more work on search engine optimisation with a tailored TrafficBuilder programme for the remainder of the year to improve their website presence and increase traffic. Stuart Watt who now runs the hotel was finally convinced by the need and benefits for Bookassist following an onsite presentation to him and his team by James Kennedy of Bookassist in Scotland. James said, "We've been really keen to get Stuart and The South Beach Hotel online for some time now and we're delighted that the hotel can see the future benefits of having 24 hour availability, multiple languages and currency and an easy to manage administration system. Being so close to Prestwick Airport and the number of inbound European visitors coming into the area expected to increase due to the weakness of the pound he thought it critical that his booking engine featured the language and currency facilities." With The Open Championship returning to Ayrshire this year increasing number of hotels are looking at their online marketing strategy and turning to Bookassist for more advice and for many properties it is now recognised as a major part of their business generation. As a footnote, the first booking at The South Beach Hotel was generated within two hours of the system going live! If ever there was a business made for blogging it would have to be the music industry. Dynamic fast moving, driven by online activity - if you need proof see how the record companies are reacting to YouTube's decision to remove music videos in the UK from Monday! Well last year two of our oldest clients came together with a unique joint venture. 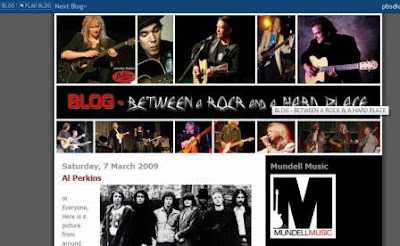 Mundell Music, who under the guidance of owner David Mundell have been promoting live music for eons, joined forces with Nick White at The Inn at Lathones near St. Andrews in Fife to promote a new live music venue. The concept which became known as Rock at The Stables was born and has recently witnessed a highly succesful FifeStock music festival at The Inn. The exclusive little venue only holds sixty but this doesn't stop top artistes from across the music spectrum arriving with guitar in hand to perform to the Scottish audiences. The Inn itself works closely with Mundell Music to ensure that alongside the gigs there are some great accommodation and dining deals and you can book the tickets and accommodation online. If you're looking for something to satiate that mid life crisis a couple of gigs at The Inn would be safer than some alternatives! "Alister Morrison has been appointed as the new director of golf at the championship standard course designed by Dave Thomas, the man behind The Belfry. He will be joined shortly by 2007 Northern Open champion, Murray Urquhart, who has been taken on as the resort's golf professional." One of the first outcomes has been a dramatic reduction to the green fees structure which probably is indicative of the market place at the current time. The resort course is competing in the area with some wonderful holiday golf courses such as Newtonmore, Kingussie and Grantown on Spey and then sits up there with the likes of Boat of Garten, Nairn, Nairn Dunbar and the new Castle Stuart course between Inverness and Nairn. The reduction in green fees is probably a measure of the competition in The Highlands area. According to the article in the off-season (March, April, October and November) visitors will be offered a round for just £30 compared to £59 last year and the rate for the summer has been cut from £79 to £55 per round. The costs of membership has also been slashed by £100 to £390. The new arrivals have replaced Alan Tait, who become the new director of golf at The Dalmahoy Hotel and Country Club near Edinburgh in early January. Later this year, Spey Valley will play host to two major tournaments – the Northern Open from May 25 to 29 and the televised European Challenge which gets underway on July 27.